The Study Group met at ABK AOT Dosokai for their monthly meeting. 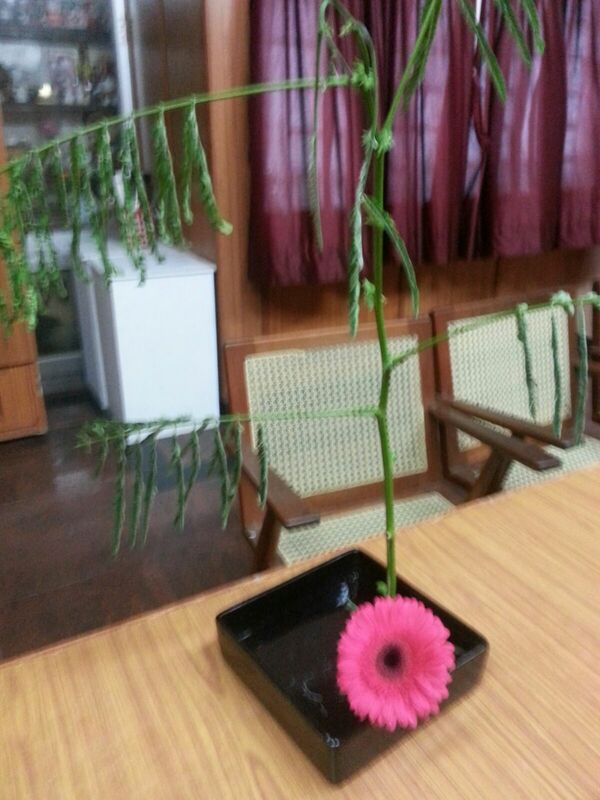 The theme for the workshop and meeting was "Ikebana and wabi sabi philisophy". There were introductory remarks by sensei Malathi and a slideshow by Ambika. As we were running short of time, she did her planned demonstration pieces as part of the workshop. Ambika began with the caveat that most Japanese do not discuss the concept of wabi sabi, they just recognise it when they see it, so deeply ingrained is it in their consciousness. “Wabi-sabi is an intuitive appreciation of a transient beauty in the physical world that reflects the irreversible flow of life in the spiritual world. It is an understated beauty that exists in the modest, rustic, imperfect, or even decayed, an aesthetic sensibility that finds a melancholic beauty in the impermanence of all things.” Andrew Juniper, Wabi-sabi: the Japanese Art of Impermanence. It refers not to the absence of material possessions but to the non-dependence upon them. Sabi objects are irregular in being, asymmetrical, unpretentious. They are well cared for, reflecting their age and experience. The origins of wabi sabi can be traced to the tea ceremony. The tea masters looked to move away from the extravagance of the tea drinking parties of the Kamakura Shogunate. This conscious move was accompanied by the use of simple, rustic, homestyle tea containers rather than the ornate expensive porcelain from China, simple tea rooms and contemplation and quiet. Tea Master, Sen no Rikyu, who is considered the father of the wabi cha (Way of Tea), also brought the philosophy of simplicity, tranquility and naturalness to Ikebana, and is considered the first person to introduce the nagiere style as well. The philosophy teaches us to embrace the imperfect and celebrate the worn both as a decorative concept and as a spiritual one. Fortified by lovely hot tea from Dalley and some tasty sweets from Meenu, we set to work. Ambika used a handmade ceramic container with beautiful texture, with anthurium leaves that revealed their age. The Amarylis lily representing the natural cycle of life. 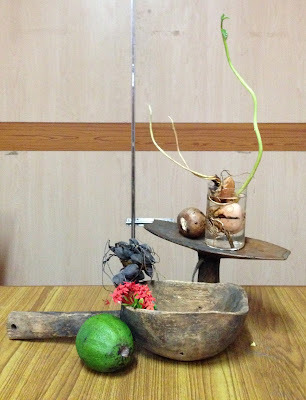 Malathi sensei used a uniquely crafted handmade ceramic vase to showcase her wabi sabi Ikebana with material from her garden. sensei Meenu celebrated the humble coconut fibre waste, from which seemed to emerge the conventional beauty of a flower in bloom. 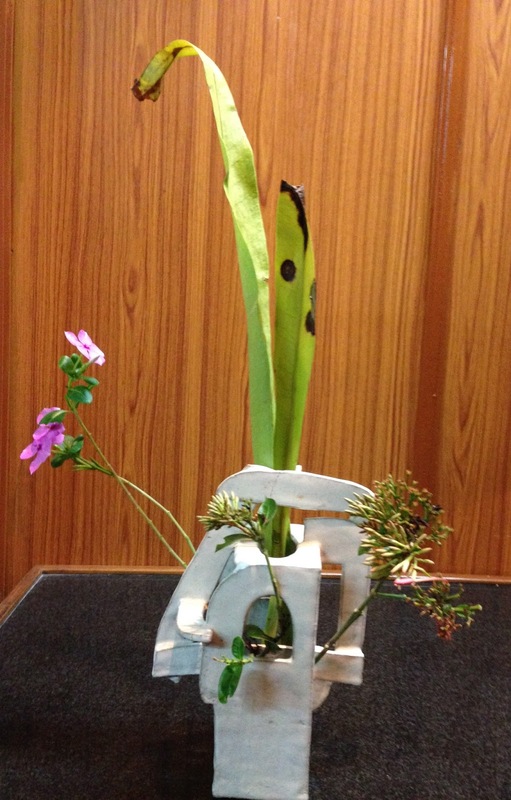 sensei Molly emphasised space in her minimalistic wabi sabi arrangement, with ixora. The innocous "aapam" pan from her kitchen was her container. 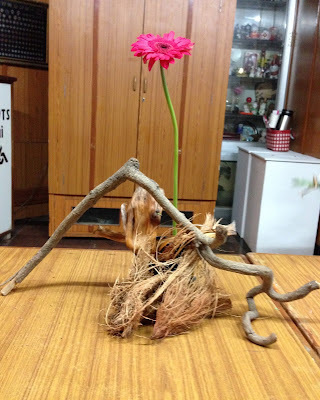 Janaki used what we usually consider untidy and clumsy - dried banana laeaves in this piece. Zaitoon used a drying and thorny branch as the shin of her wabi sabi arrangement. Janaki was inspired by another Leonard Koren quote to use the avocado seedlings, seed and fruit in her work. "But when does something's destiny finally come to fruition? Is the plant complete when it flowers? When it goes to seed? When the seeds sprout? When everything turns to compost? " We experimented with the material, using the African wooden ladle, with its beautiful worn texture, in focus. The next meeting will be on Oct 9th at 11 am at ABK, when Trishala and Prerana will demonstrate.